Despite Apple’s efforts to improve conditions for workers at manufacturing plants in Asia where its iPhone and other products are assembled, it seems it still has much to do in order to get on top of the situation. An undercover BBC report filmed at Pegatron factories near Shanghai claims that a set of standards laid down by Apple several years ago in a bid to improve conditions are being breached at a number of sites. Updated on 12-19-2014 by Malarie Gokey: Added report from the Telegraph, which includes an email to employees from Apple’s Jeff Williams and Tim Cook. One undercover reporter claimed they were made to work 18 days in a row despite asking repeatedly for time off, while another said they had to work shifts of up to 16 hours, taking them past the 55-hour weekly maximum stipulated by Apple. Another reporter claimed they had to share a “cramped” dormitory room with 11 other workers. The BBC’s investigation found some workers being made to attend unpaid meetings before and after regular working hours, and others being forced to do overtime when such work is supposed to be voluntary. 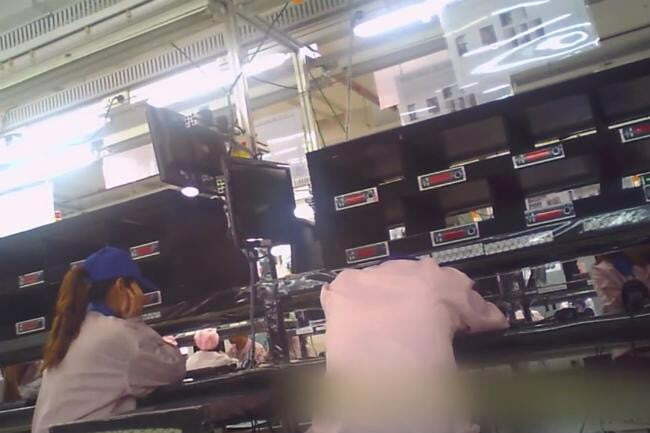 The company said that while it wasn’t unusual for factory workers on its production lines to nap during breaks, it would be sure to look into the allegation that exhaustion is leading them to fall asleep during working hours. Shortly after news of the documentary broke, Apple senior vice president of operations Jeff Williams sent an email to 5,000 UK employees to let them know the BBC investigation omitted key details and statements from Apple on the subject of factory conditions. The Telegraph picked up the email and provided the full text in an article on its website. Williams also stated that Apple is aware that poor working conditions in factories and the use of illegally mined tin in its products still happen. He assured company employees that Apple doesn’t turn a blind eye to these situations and restated Apple’s commitment to improving working conditions along every part of its supply chain. “We know there are a lot of issues out there, and our work is never done. We will not rest until every person in our supply chain is treated with the respect and dignity they deserve,” he wrote. Pegatron, meanwhile, said it’s looking into the BBC’s claims and would act if it found that regulations are being broken at its factories. The manufacturer is under huge pressure to fulfill orders from Apple, but knows if factory workers are being mistreated its contract with the company could be in jeopardy. Apple has also worked to improve conditions at plants operated by Foxconn, another of its high-profile suppliers in the region. Several years ago there were regular reports of protests, riots and even suicides at its factories, though more recently the situation appears to have improved. The Panorama team also traveled to Indonesia to look at other parts of Apple’s supply chain and found that “tin from illegal mines” could be ending up in its products. It also claims to have discovered children “digging tin ore out by hand” in dangerous conditions. Of course, Apple isn’t the only tech firm to face scrutiny over working conditions at factories in its supply chain. Earlier this year Samsung was forced to suspend business with a supplier after a workers’ rights group said it’d found evidence of child labor at the site.